On Saturday (my birthday) I went to see the Wilton’s Music Hall production of The Great Gatsby which is running until Sunday 23rd March. With it’s nostalgic, fun party vibe it was not a disappointment, and many theatre-goers had taken the opportunity to dress up in jazz-era style flapper dresses and suits. For those who haven’t read it, the tale is set in 1922 post war America and is penned by F. Scott Fitzgerald who conjures up a glamorous image of the rich (and restless) on Long Island. The story was published in 1925, four years before the collapse of the American stock markets, and Fitzgerald portrays a society that is being destroyed by money and dishonesty. However the production is largely lighthearted and there is an emphasis on the fun side of the lives of the wealthy socialites who lived in 20s New York. There is an abundance of parties, cocktails and champagne on stage, and the performance is full of glitz and style. Directed by Peter Joucla, the performance is very funny; the actors and actresses capture the humour of the story perfectly. When the set is changed the small cast disguise the moving of props with a capella 20s show-tunes, which adds to the atmosphere and fun mood of the show. The leads are strong. Kirsty Besterman is excellent as the deceitful Daisy, while the mysterious Gatsby himself is played by the very handsome and dapper Michael Malarkey who meets his tragic end seconds after stripping to his swimming trunks. 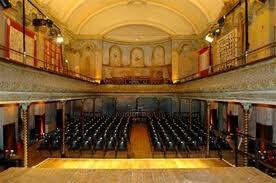 For those who have not been to Wilton’s, it is well worth a visit. Wilton’s is led by Frances Mayhew and produces an exciting programme of diverse entertainment including theatre, music, comedy, cinema and cabaret. There is no denying it is in a location well off the beaten track, down an unassuming alley in a residential area between Tower Hill, Shadwell and Aldgate East stations. You would never pass it and would only go to the area specifically to visit to Wilton’s, as there is nothing else in the area of any interest. From the outside you would never imagine the beauty of the music hall inside, with its ornate carved wood balcony. The renovations have been sensitive to the history of the building; it is genuinely shabby chic, and very atmospheric with it. 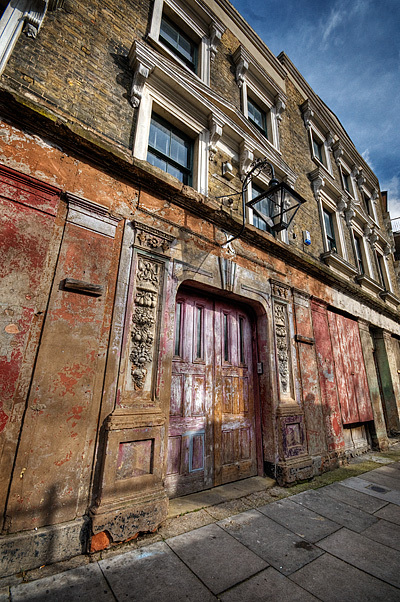 The website says it is the world’s oldest surviving Grand Music Hall, a unique building comprising a mid-19th Century grand music hall attached to an 18th Century terrace of three houses and a pub. Originally an alehouse dating from 1743 or earlier, it may well have served the Scandinavian sea captains and wealthy merchants who lived in neighbouring streets. For those who would like to learn more about the historic building, pop along to one of their weekly history tours which take place every Monday. They cost £6 and last for an hour. Wiltons is definitely one of London’s hidden gems.